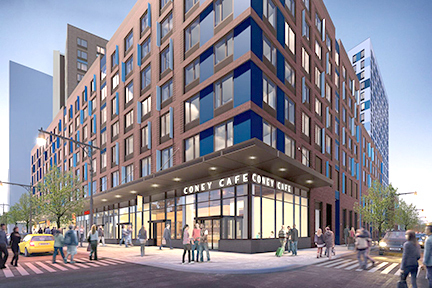 Ground has been broken for Phase I of a nearly 1,000-unit development in Coney Island. The project’s first phase, a 100 percent affordable project designed by Handel Architects, will include 446 units for the formerly homeless, very low-, low- and moderate-income households and is expected to open in 2021. New York City Department of Housing Preservation & Development (HPD), the New York City Housing Development Corporation (HDC) and the New York City Economic Development Corporation (NYCEDC) joined BFC Partners, L+M Development Partners, and Taconic Investment Partners for the ground breaking. “Today marks a major milestone as we break ground on the first of three phases that will ultimately bring more than 1,000 new affordable homes to the heart of Coney Island,” said HPD Commissioner Maria Torres-Springer. The first phase of the three-phase project will include two 16-story towers above a seven-story podium, with office space for the NYC Human Resources Administration occupying 66,000 s/f on the ground and second floors in one building. All residential units and mechanical equipment will be located above the ground floor, and the buildings will include deployable flood barriers at the main residential entrances to prevent flooding within the building. Similarly, the retail spaces will be flood-proofed, providing resiliency to future businesses. Retail frontage along Mermaid and Surf Avenues will help to activate this corridor and expand the Coney Island commercial district west. The project is located two blocks from the Stillwell/Coney Island subway stop and two blocks from the historic Coney Island Boardwalk. Phase 1 of the project builds on ongoing City investment across the neighborhood to create affordable and mixed-income housing, infrastructure upgrades, and new cultural offerings including the restoration of the historic Child’s Building, the new 5,000-seat Ford Amphitheater, and the recently-opened Ocean Wonders: Sharks! exhibit at the New York Aquarium. In 2009, a 19-block rezoning created a 27-acre amusement and entertainment district on Coney Island, along with plans to develop new amusements and thousands of affordable and market-rate homes. The full implementation of this plan, which continues today, is expected to generate up to 6,000 permanent jobs, 25,000 construction jobs, and $14 billion in economic activity. Phase I of the new development, designed by Handel Architects, is expected to open in 2021.